How Does Moon Gardening Work? The moon has four ‘phases’ or ‘quarters’ – each last about 7 days. In the first two quarters, the ‘new’ dark moon you see gets bigger and more visible. This is known as the ‘waxing’ phase. You see an increase in light until the full moon is visible. The 3rd and 4th quarters are after the full moon. This is when the light begins to ‘wane’ or decrease. Then the cycle starts again. If you’re still taking a ‘hit and miss’ approach to timing in your garden, there’s a much easier way! 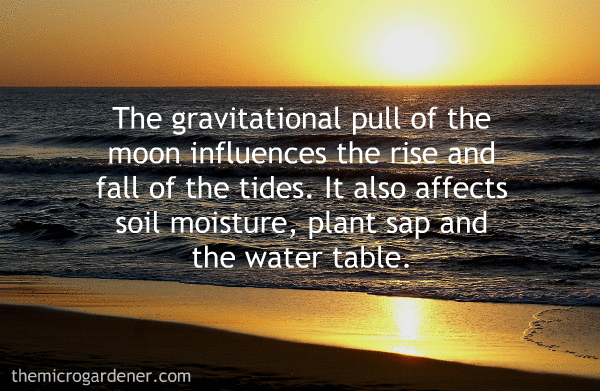 Just as the moon influences the rise and fall of the tides, it also has a gravitational effect on the moisture in plants (sap), the soil and water table. These effects are magnified at different times of the month’s moon cycle. The tides are highest, for example, at the time of the new and full moon when lunar gravity pulls water up. At this same time, the moon also causes moisture to rise in the earth. What’s the significance of moon phases for you? There is more moisture in the soil at this time. 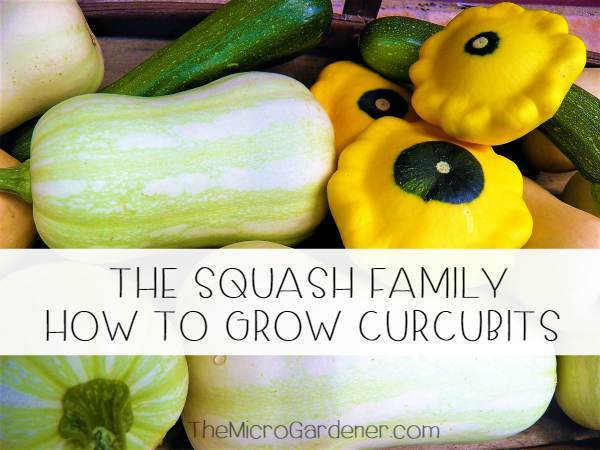 This encourages seeds to swell, burst and sprout because that’s when they will absorb the most water. If you’ve ever had trouble germinating seeds, I encourage you to try again. At the right time of the month. The difference I’ve had in results over the years, has convinced me timing has a major effect on successful seed germination. 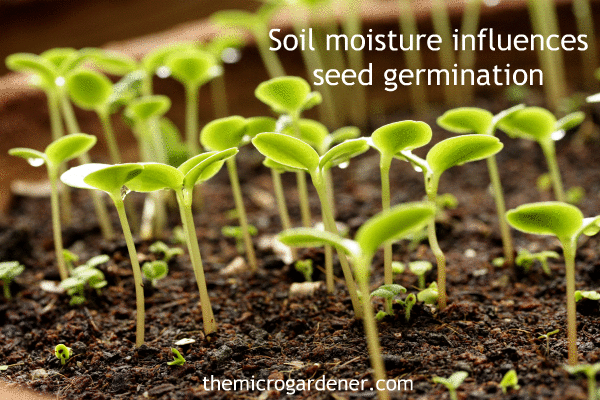 If you know WHEN soil moisture is rising, this can help you have greater success with seed germination. Sow your seeds at the best time. If you buy or plant seed, this can save you a LOT of money over time. 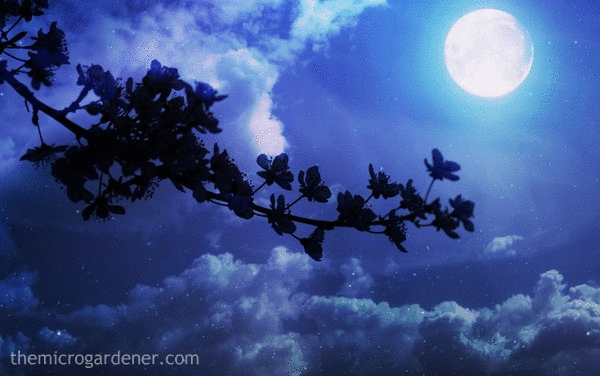 The amount of moonlight at different times also influences the growth of plants. As the moonlight increases (new moon and second quarter), this stimulates leaf growth. After the full moon, the moonlight decreases, putting energy into the plant roots. At this time, the above ground leaf growth slows down. So this becomes a favourable time to plant your root crops and bulbs, because of the active root growth. Knowing this helps you plant at a time when you can work with nature’s law of gravity and benefit from strong growth. At different moon phases, the gravitational pull of the sun and moon are combined to create a high sap run in plants. 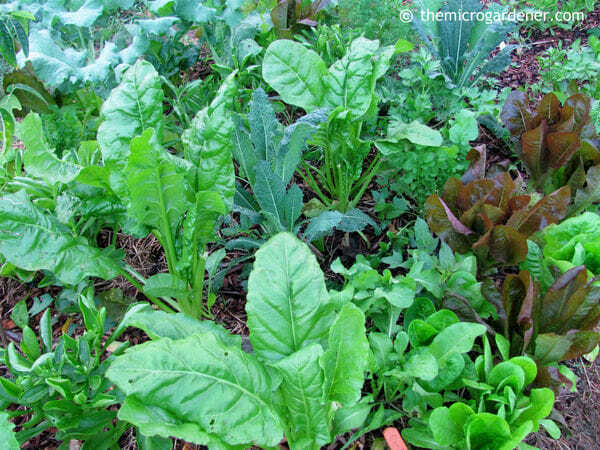 This is an optimum time to plant above ground crops like leafy greens. At other times, these natural forces create a rest period for plants. 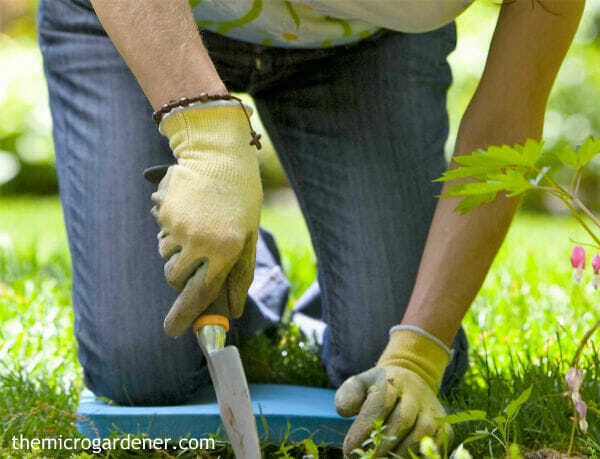 This is an ideal time to prepare new gardens, prune, weed or harvest. Or just take a well deserved rest yourself! Nine years ago when I found out about moon gardening, I started to test out for myself whether it would make any difference in my garden. I experimented by planting edible crop seeds and seedlings in the same garden beds and seed trays under identical conditions except for the timing. Some were planted at the optimum time for growth and some when it was not ideal. Without a doubt, the results proved to me that timing DOES make a difference. From my observations over time I can see when plants have a renewed energy and vitality and when they are just sitting there not doing much. Now I understand the reason behind these different growth phases and plant accordingly to take advantage of it. From my experiences over 9+ years, moon gardening provides many benefits over just planting with a ‘hit and miss approach’ at any time during the month. Seeds definitely germinate sooner. So you can speed up the time taken to get crops on the table. 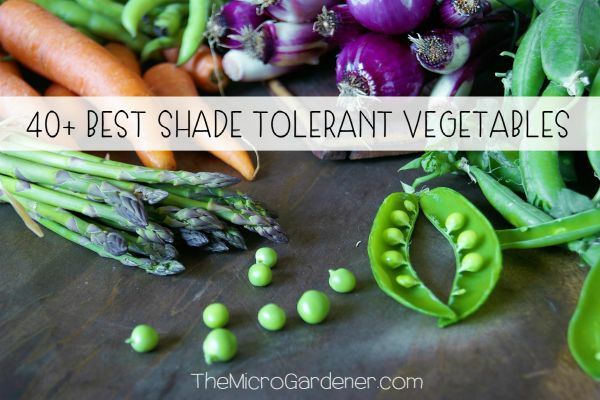 Root vegetables and bulbs also shoot more quickly. This is especially valuable if you have a short growing season or are raising seeds late in the season. Plants appear to grow faster and are healthier. When comparing plants sown at the optimum time to those that weren’t, I have noticed they are larger, more robust and not weak and straggly like the others. Plants have less pests because they are stronger. This minimises the need for intervention to fix a problem + the cost and time it takes for pest management. Love that! 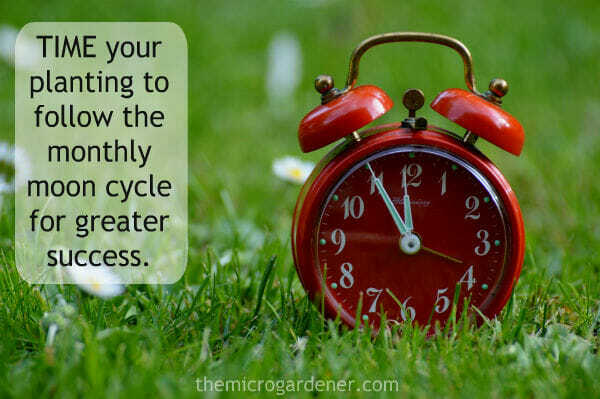 Timing is a BIG factor you can use to optimize the healthy growth of your garden. Does Timing your Planting with Moon Phases Make a Difference? I’ve done dozens of experiments with numerous crops that grow above and below ground, when taking cuttings, sowing seeds and fertilising. 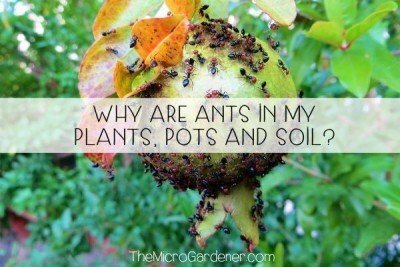 I’ve always been a curious gardener! I really have to see something working before I share it with others. I’ve put moon cycle planting to the test and find it a fascinating way to fine tune your timing. For me personally, I know it works. I’ve seen the evidence. I think tuning into nature’s rhythms makes sense, but I understand not everyone will give it a try. This is a video of one experiment I did with garlic. I hope you find it interesting. I think the results speak for themselves. So how DO you moon garden or plant by the moon exactly? The method I use, is to follow the moon phases on a simple, easy-to-use moon calendar. I set the new moon date at the start of each month and use it year after year. It tells me exactly what activities to do at different times of the month. 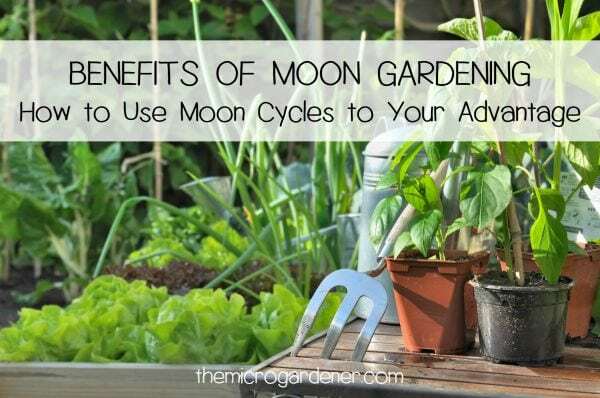 The Moon Calendar divides the 28-day lunar cycle into 6 separate gardening periods. It reveals the optimal days for planting different crops, when to harvest, propagate, prune, fertilise, cultivate and even the best time for fishing! To start working with moon phases, on the first of the month, all I do is align the new moon symbol on the calendar wheel (green) to the date of the new moon for the current month. I leave it set in that position until the next month. What are the advantages of this Moon Calendar? Is PERPETUAL! So you buy once and never need another moon calendar EVER again (less waste, more sustainable and cheaper!). Never goes out of date and is SO easy to use. Applies to any climate, anywhere in the world. How Can Moon Gardening Benefit You? The key benefit is TIMING. One of the practical things I use the moon calendar for is to show me when to apply liquid fertilisers, so the plants make the most of them. i.e. taking up the plant food when the sap is running strongly. Learn what Helen C of Sydney, Australia has to say about her experiences with moon gardening and using a moon calendar. 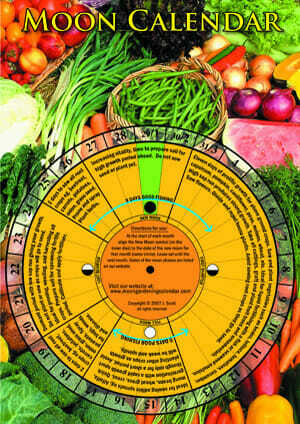 If you use sprays, this moon calendar also indicates when to apply them for pests, weeds and diseases for optimum effect. By applying at the best time, you can save money by not wasting product. You can optimize the benefits of using it by getting your timing right. 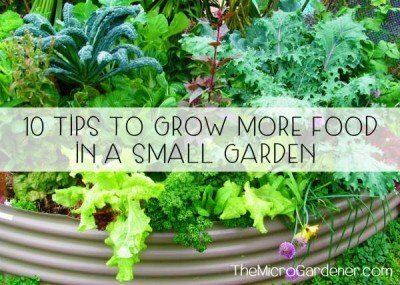 It also helps you to pace your garden activities throughout the month. You don’t always have to be planting – just try to plant at the BEST time. I use the moon calendar to plan the best dates for sowing what I intend growing. I’m a more organised gardener now! Sow and plant above ground crops (such as salad greens, tomatoes, peas, beans, melons, cucumber etc). 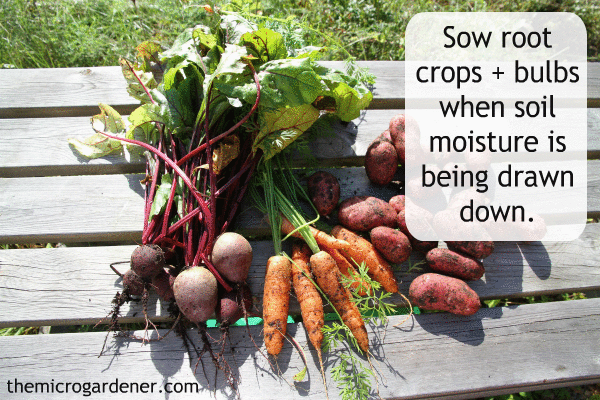 Sow and plant root crops (including carrots, potatoes, onions, garlic, bulbs etc). Take cuttings and propagate when sap run is high to produce strong growth. Graft and plant fruit trees and ornamentals. Divide and repot house plants. Achieve quick germination and a rapid growth spurt of edible sprouting seeds and microgreens. Prune, weed and harvest (including for long storage life). Even go fishing for best results! I’m certainly not fanatical about rigidly doing everything by the moon – the reality is, that life happens! I use it as much as I can. But, if it’s more important to get a pot bound plant into the ground for example, then I don’t wait for the perfect moment! I’ve had to rescue plants what would have turned into ‘dried arrangements’ just to save them and plant at the ‘wrong time’ of the month. That’s common sense gardening! If you really need to get something planted, don’t stress if it’s not the BEST time. Just get it done! Sometimes the weather means I have to make a decision to plant earlier than is ideal. At other times, I don’t want to wait until the absolute best time in the following month, because it will be too late in the season to sow. It’s OK! So, I hope I’ve given you something to think about – and perhaps shed a little ‘light’ on a new secret weapon to use! 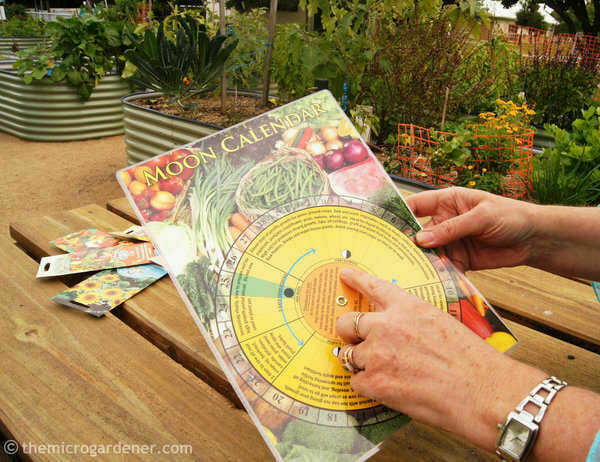 You’ll certainly save money and time in the garden using a moon calendar. You can obtain more information on and BUY YOUR OWN HERE. If you’ve already been moon gardening, I’d love you to share your experiences or if you have questions, please leave a comment. For more tips , check out posts in the How to Grow and Tips & Tricks categories. Thanks for raising an interesting question. This Moon Calendar is based on the moon’s influence only – using its various phases to determine growing times and dormant times. It not based on any zodiac constellations – astrological or astronomical. Rather, it was developed around the moon’s influence over tides, groundwater and sap flow in plants at various times of the month. Just as the moon influences the rise and fall of the tides each day, it also creates a monthly lunar cycle of rise and fall in the groundwater tables. Without the pull of the moon on the Earth’s water, it is believed the Earth’s rotation would only take 10 hours instead of 24 hours. This movement of the groundwater also creates a rise and fall in the pressure of water in the plants, resulting in periods of high and low sap run at different times of the lunar month. It creates prolific top growth when sap run is high and favours the development of root crops at other times. It aligns with much of the traditional moon gardening folklore gathered over the centuries by farming cultures. The A4 calendar has a moving dial that divides the 28-day lunar cycle into six periods of various lengths for different activities such as planting above-ground crops, another time for root crops, when to fertilise, cultivate and propagate. The new moon on the inner rotating dial is lined up with the matching date of the new moon for each month and the relevant gardening advice read off for each day. In this way it can be used month after month for years ahead. The Australian farmers who created this calendar have used this system for more than 40 years as gardeners – growing vegetables and nursery plants commercially. Their experiences with successfully using moon phases for both growing food commercially and propagating plants at their nursery, led them to design the calendar to help others. Having known them for the past 8 years, and used this calendar myself every month over that time, from my experiments and experiences, it has proven its worth over and over. It is also a perpetual design which is more sustainable because there’s no need to buy a new calendar year after year, wasting trees and resources on our beautiful earth. I choose to use this particular one because these values sit with my own ethics and values, as well as its simplicity. Having studied biodynamics, I originally used an annual biodynamic calendar however, in practice I found it too complicated. I have a busy life! I hope this helps you make a decision if this is the right Moon Calendar for your own use. Thank You so much, so glad I found your site, it is great. I have always believed in planting by the moon. At the new moon, the lunar gravity pulls water up, and causes the seeds to swell and burst. This factor, coupled with the increasing moonlight creates balanced root and leaf growth. 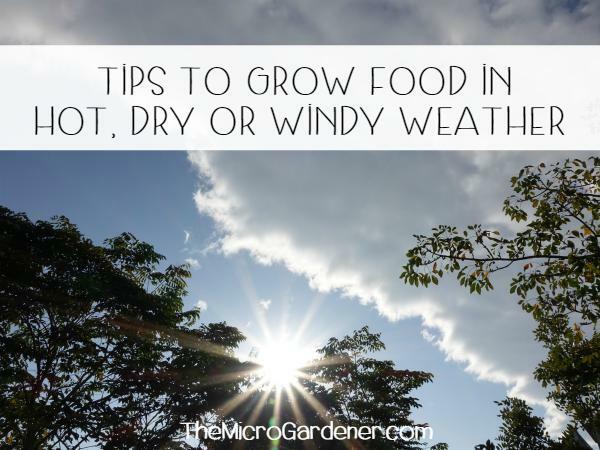 This is the best time for planting above ground annual crops that produce their seeds outside the fruit. Examples are lettuce, spinach, celery, broccoli, cabbage, cauliflower, and grain crops. Thanks for your feedback and comments Shari. Happy planting! I really want to try this for next year gardening. Does this work same even if we sow seeds and transplant veggies in container? Yes! Moon gardening works in the soil or a container containing moisture in the soil mix that is drawn up or down during the moon cycle. You can find the Moon Calendar here – it’s a helpful tool to get started and follow each month. Moon gardening seems to be a unique idea. Are you sharing your own experience or it has some scientific facts behind this? I am sharing from my personal experience and experiments. If you’d like to read more about moon gardening, there are some interesting scientific research links @ http://www.ianslunarpages.org/Lunar_gardening.html.